The MP8 Flaming Bomb cartouche is another desirable example of a marking found on Spanish Civil War small arms. The cartouche itself is similar to an acceptance mark often found on US rifle, which is a flaming bomb. The Spanish “MP8” is most clearly differentiated from the US marking by the inclusion of the letters and numbers “MP8” within the bomb, and the much larger size of the cartouche. While the cartouche is known to be of Spanish origin, not much else is officially known regarding its true meaning. The most accepted consensus about this marking is that it is from a Spanish arsenal or depot which repaired/rearsenaled the weapons found with the mark on the stock. It should also be noted that it has been generally accepted that this is a post-Spanish Civil War marking made by the victorious Nationalist forces under Franco’s leadership. 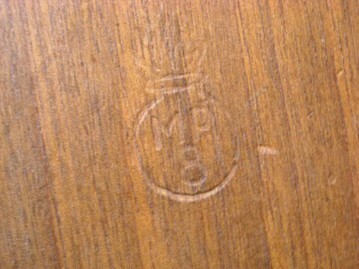 Some claims have been made that the mark may even be a post-World War II marking, but there has been no real evidence of when the mark came into use. It is also important to note that the particular arsenal or depot that produced this mark has never been determined. Even among collectors from Spain there has been no positive link between the “MP8” cartouche and a particular Spanish arsenal. In some cases it may be difficult to notice the marking. It is a common trait for these Spanish Mosin Nagants to be in a heavily sanded condition. This isn’t always (though at times it will be, unfortunately) the work of an individual here in the United States, but rather by someone in Spain. If you do have a possible Spanish Civil War Mosin Nagant, be sure to thoroughly examine the stock to see if the remains of this “MP8” cartouche can be found. Please note, solely having the cartouche will not 100% prove your rifle is from Spain. As with all military surplus rifles it is common for people to replace “sporterized” and cut down stocks with complete stocks to make the rifle look more “correct”. It is therefore possible to have an “MP8” marked stock on a rifle that didn’t originally have it.